The UCLA Department of Head and Neck Surgery provides cutting edge diagnosis and treatments, and supports a staff of renowned physicians, surgeons and researchers. 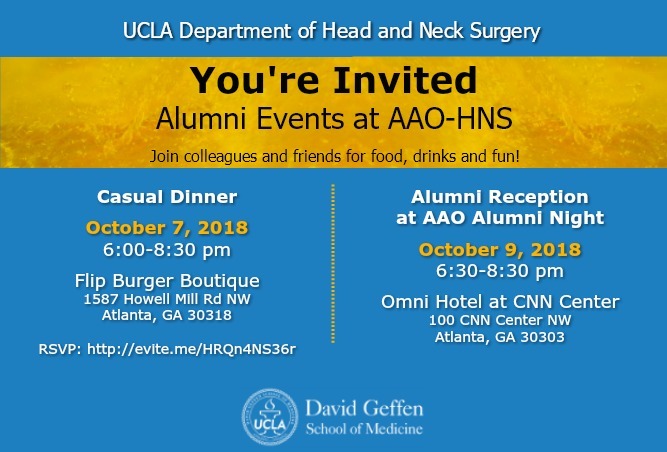 Demonstrating continued excellence in the field of Head and Neck Surgery, the UCLA Department of Head and Neck Surgery along with its varied Centers of Excellence, is often the subject of stories in newspapers, magazines, and journals. The Department also frequently issues news releases to keep the community informed on the latest developments in Head and Neck Surgery, the treatments available at UCLA, and various milestones within the Department. We include here a collection of recent stories, and an archive of older articles, for your further information. 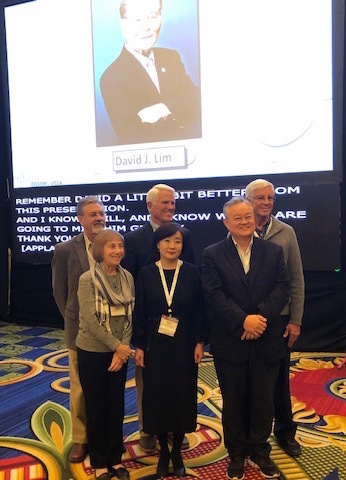 The Association for Research in Otolaryngology held a symposium focusing on the accomplisments of the late Dr. David Lim. Faculty members Dr. Sung Moon and Dr. Federico Kalinec were among the speakers who paid tribute. Dr. Lim's research on the Inner Ear and Utilization of Audtoriy Cell Lines were some of his contributions discussed at the symposium. Dr. Ronald Canalis, Professor Emeritus of Head and Neck Surgery, was named the recipient of the 2018-19 Carole E. Goldberg Award. The award was created in 2015 to recognize the extraordinary service by an emeritus/emerita professor. 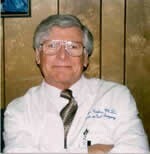 Dr. Canalis retired in 2010 after thirty-seven years at UCLA as a surgeon-scientist with extraordinary skill as a teacher and mentor. He is a world-renowned authority on the facial nerve and has offered special anatomy labs to resident physicians who praise his intellectual nimbleness, civility and graciousness. He was, and remains, a beloved figure for his numerous trainees. Dr. Gerald Berke from the UCLA Voice Center for Medicine and the Arts for a conversation about voice management for performing artists. 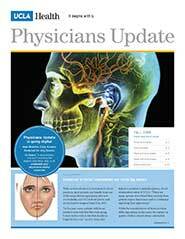 The UCLA Head and Neck Surgery Department is thrilled to be featured in the Fall 2018 UCLA Health Physicians update.Learn about the vision of the future from new department chair, Maie St. John, MD, PhD, and the exemplary work of some of our programs. Click on the headline to read the full articles. Dr. Vishad Nabili has been appointed to the Residency Review Committee. Training programs in Otolaryngology - Head and Neck Surgery in the United States are evaluated by the RRC. The committee is made up of representatives of the American Medical Association, the American College of Surgeons and the ABOHNS, and are accredited by the ACGME. MSN syndicated a Q&A with Dr. Nina Shapiro on what the color and consistency of earwax can reveal about your health. The article was originally published by Well + Good. Shapiro is a pediatric head and neck surgeon at UCLA Mattel Children's Hospital. This work will provide the research community with novel model systems and databases of gene expression profiles from each model that can be used to design and perform pre-clinical tests of agents to relieve pain and tumor growth in schwannomatosis. The successful completion of this study will lead to a major leap forward in our understanding of schwannomatosis manifestations and in the availability of tools that can used over the next decade, to develop novel, efficacious therapies to control tumorigenesis and treat this pain. Maie St. John, MD, PhD has been named the Chair of the Department of Head and Neck Surgery. Dr. St. John was selected for this position following a national search. She is succeeding Dr. Gerald Berke, who lead the department for 26 years. Dr. Vishad Nabili, Program Director of the Head & Neck Residency Program, was awarded the Parker J. Palmer Courage to Teach Award. The honor is presented to program directors who find innovative ways to teach trainees and provide quality health care while remaining connected to the initial impule to care for others. Dr. Gerald Berke was named one of the west coast's best throat doctors for musicians. His treatment of multiple singers, including John Mayer, have made him popular as he often opts for out-patient procedures for voice treatment. The article appeared in Billboard magazine. Dr. Akira Ishiyama was awarded the Gold Medal of the Diaspora Ministry in Armenia. Dr. Ishiyama travels to the country annually to perform cochlear implant surgeries with the Armenian International Medical (AIM) Fund. Dr. Jeffrey Suh was featured in a profile with Korea Times. Dr. Suh's specialty focus is on complex sinus disease. In a groundbreaking new study, UCLA researches have advanced a robotic surgical technique to successfully access a previously unreachable area of the head and neck. The procedure was developed by Dr. Abie Mendelsohn. In a recent sold-out show at the Hollywood Bowl, singer-guitarist John Mayer dedicated a song to Dr. Gerald Berke, chair of Head and Neck Surgery at UCLA. He thanked Dr. Berke for getting him "singing on the stage again." The Agoura Hills Acorn reported Thursday on a woman who underwent a specialized, minimally invasive surgery at Ronald Reagan UCLA Medical Center to treat her extreme vertigo, which resulted from an inner-ear disorder known as Meniere's disease. Her surgeons, Dr. John Frazee, UCLA professor of neurosurgery, and Dr. Akira Ishiyama, UCLA professor of head and neck surgery, were quoted. A five-year study led by Dr. Marilene Wang, a professor-in-residence in the Department of Head and Neck Surgery, has found that head and neck cancer patients receiving radiation as part of their treatment were less likely to suffer unwanted side effects such as worsening of diet, need for a feeding tube, or narrowing of the throat passage if they complied with a set of prescribed swallowing exercises called a swallow preservation protocol (SPP) during therapy. Under the care of Head and Neck Surgeons Nina Shapiro, MD and Abie Mendelsohn, MD, 5-year old patient, Leonidas Hill recently made history at UCLA when he became the first pediatric patient in the western U.S. to undergo transoral robotic surgery to repair his laryngeal cleft. UCLA launches first face transplantation program in western U.S.
Demand for state-of-the-art face transplant procedures is rising, surgeons say, resulting in part from prolonged U.S. military action overseas. The UCLA program will integrate specialists from throughout the UCLA Health System, including the areas of head and neck surgery, plastic and reconstructive surgery, oral surgery, psychiatry, pathology, anesthesia, internal medicine, radiology, neurology, ethics, and rehabilitation services. Head and Neck Surgeons include Dr. Keith Blackwell, professor of head and neck surgery and Dr. Vishad Nabili, assistant professor of head and neck surgery. Dr. Quinton Gopen, assistant professor of head and neck surgery, was featured in a KNBC-Channel 4 news report of a patient whom Dr. Gopen discovered had a tiny hole in one of her ear canals, which allowed sounds from inside and outside her body to reverberate inside her brain. After he plugged the hole during surgery, the woman’s symptoms vanished and her hearing returned. Dr. Nina Shapiro, M.D., author of Take a Deep Breath, provided information for parents and caregivers about children's breathing issues and the latest research in pediatric breathing issues and airway safety. She also discussed her current research with RAND Corporation that studies and identifies food that lead to high choking incidents in children. 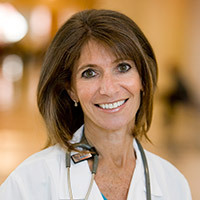 Using these findings, she plans to recruit a national panel of pediatric experts, including otolaryngologists, pulmonologists, anesthesiologists, emergency-room physicians, and intensivists (intensive-care-unit specialists) to create guidelines for food products and submit them to the Food and Drug Administration to create a standard for food labeling similar the current framework in place for toys. The Feb. 28 Hollywood Reporter ran an article after singer Celine Dion was experiencing weakness in her vocal cord. Dr. Gerald Berke prescribed 6-8 weeks of voice rest for Celine to recover from her condition. Variety, Las Vegas Sun and others also covered Celine's visit to the UCLA Department of Head and Neck Surgery. A study published in the journal of Otolaryngology-Head and Neck Surgery, co-authored by Dr. Nina Shapiro, associate professor in the Department of Head and Neck Surgery at UCLA, found that racial and ethnic disparities among children with frequent ear infections can significantly influence access to health care resources.